I was away from the computer yesterday so here’s my belated entry to the Twookieparty, especially as Theresa from The Green Apron is judging and offering some of her amazing preserves as prizes – I’d put in a fair effort just for her raspberry and chocolate jam, as tasted recently at the Food Bloggers Country Outing. I’ve been making these Chocolate Chip Cookies from David Leite‘s New York Times article a lot lately, experimenting with salt levels – the original recipe has LOTS – and this is the version that I’m happiest with. I use regular salted butter in my baking so have substantially scaled back on the amount of salt called for in the original. If you are a salt fan, however, you could sprinkle a few flakes of sea salt, Maldon for preference, on top of the dough before baking. 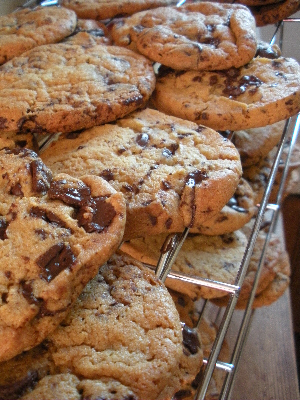 I also cut back on the amount of chocolate, from a whopping 560g to a still substantial 400g, using a mixture of chopped up bars (70% cocoa content) and chocolate chips (50%) which adds a pleasing texture to the finished cookies. And, if you can resist, do wait for 36 hours before baking the cookies. I baked off several batches this week and the dough that had sat around for a day and a half was by far and away the tastiest of the lot. You’ll have so much dough that it’s well worth baking them over a few days and seeing what you think. Any excess dough, shaped into logs, freezes well (cook from frozen, for 1-2 minutes extra), or you can simply make half the recipe. The best ever cookies? The best we’ve had around here for sure! There are plenty more cookie recipes appearing on Twitter – just search for #Twookieparty or there’s a direct link here. This recipe is adapted from David Leite’s original, published in the New York Times on 9 July 2008, and converted into metric by Clothilde at Chocolate and Zucchini. Cream the butter and sugars together until light and fluffy. Add the eggs, one at a time, and the vanilla and mix until well combined. Whisk the flour, bicarbonate of soda, baking powder and sea salt together in a large bowl. Add to the butter-sugar-egg mixture and mix carefully until just combined. Add the chocolate and gently fold in. Cover with plastic wrap and refrigerate for 24-36 hours. Preheat your oven to 170°C (160°C fanbake). Line two baking sheets with greaseproof paper and, using a strong teaspoon, scoop walnut-sized balls onto the baking sheet, leaving at least 4cms space between the cookies. Bake in the preheated oven for 14-16 minutes, until golden brown but still soft. [In my oven, I baked them for 8 minutes, before turning the trays around and baking for another 6 minutes]. Remove the greaseproof paper immediately from the tray, and transfer to a cooling rack. Repeat with the rest of the dough, reusing the sheets of greaseproof paper. They are the perfect lunchbox treat – enjoy! Just got around to making them. Took your advice re: 400g chocolate. They are v. chocolatey and the sea salt on top added a zing. Gillian, you would have loved the Salted Caramel and Hazelnut Squares that I made for Saturday’s IFBA workshop! I’ll post the recipe up this week and you can see what you think.